The Film Board has banned "Shakespeare Must Die" by director Ing K, saying the movie's political content would cause divisions in the country. 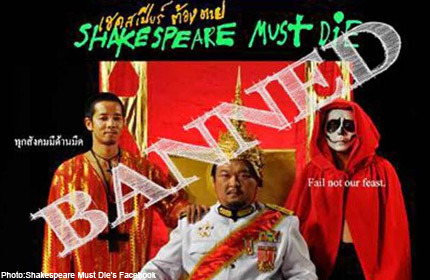 "Shakespeare Must Die" is the second Thai movie banned from commercial release under the Film Act of 2008. The first is "Insects in the Backyard" by director Thanwarin Sukkhapisit, which was banned in 2010. "Shakepeare Must Die" had received support from the Thai Kem Kaeng (Strong Thailand) fund under the Cultural Ministry’s Office of Contemporary Art and Culture. An adaptation of "Macbeth", "Shakespeare Must Die" blended black magic and politics. Ing K previously co-directed the critically acclaimed documentary "Citizen Juling", about the beating death of a teacher in southern Thailand. An earlier film by her, the controversial "My Teacher Eats Biscuits", was not publicly released in Thailand. Directed by Ing K, or Samanrat Kanjanavanit, and produced by “Pink Man” artist Manit Sriwanichpoom, “Shakespeare Must Die” is based on the Scottish Play, with “some cinematic and Thai cultural adaptations,” according to a director’s statement. The movie’s funding, by the country’s Ministry of Culture, was granted by Abhisit Vejjajiva’s government in 2010, but it was submitted to the censorship board under his successor, Yingluck Shinawatra, last month. It was due to be released later this year. Thailand has barred controversial movies in the past, including Apichatpong Weerasethakul’s “Syndromes and a Century” in 2007 and more recently, Tanwarin Sukkhapisit’s “Insects in the Backyard,” a sexually explicit drama about a transgender father whose teenage children turn to prostitution. Ing K herself is no stranger to such obstacles: Her 1998 film “My Teacher Eats Biscuits” was raided by police at a screening, and it took her 10 years to release “Citizen Juling,” her documentary about unrest in Thailand’s Muslim south. With its political overtones, “Shakespeare Must Die” recalls recent events in Thailand’s tumultuous history. In one scene, the dictator addresses his subjects in front of a red-and-yellow flag — echoing the country’s rival red- and yellow-shirt contingents — while another scene references imagery from the 1976 Thammasat University massacre, specifically a widely seen photo of a man beating the hanging corpse of a student demonstrator. “Shakespeare Must Die” has experienced its share of setbacks prior to the censorship ruling. Not only did the 2010 red-shirt riots hold up production, but postproduction was delayed during last year’s floods. The link with the works of the Bard (Shakespeare or Francis Bacon, whichever floats your Maldives boat) is tenuous. Whatever you think is right, a blatant comment on you know what is bound to lead to censorship. (Reuters) - Censors in Thailand have banned a film based on William Shakespeare's tragedy 'Macbeth', saying it could cause divisions in the country where an uneasy truce persists after several years of sometimes bloody upheaval and political polarization. A trailer for the film, directed by Ing Kanjanavanit, shows scenes from Thailand's recent past, including a 1973 crackdown on student protesters and street clashes in 2010 between the military and anti-government demonstrators in which 91 died. "The film 'Shakespeare Must Die' has content that causes divisiveness among the people of the nation," the Film Censorship Board said in a statement late on Tuesday. "The film is grouped under films that are not allowed to be distributed in the Kingdom." 'Macbeth' is the story of a power-hungry general in ancient Scotland who kills the king for his throne, and commits more murders to hold onto it. Themes of greed and power could touch a raw nerve among Thais who have been divided since the run-up to a 2006 coup that toppled former premier Thaksin Shinawatra. He is adored by the rural masses, but detested by royalists and Bangkok's elite. Thaksin and some of his supporters have been accused of republican leanings, charges they deny. Anything that involves monarchy is a highly sensitive issue in Thailand. Ailing 84-year-old King Bhumibol Adulyadej is regarded as semi-divine and criticism of the monarchy can be met with charges of lese-majeste, which carry up to 15 years in jail. That does not appear to be the trouble with the film, which was the last one to receive support from a Culture Ministry fund under the previous government of Abhisit Vejjajiva, an opponent of Thaksin. "I was shocked. I didn't expect this film to be banned," director Ing told Reuters on Wednesday. "Yesterday the censor board asked me if I wanted to change the current political system." Thaksin's sister Yingluck is now prime minister, but he remains in self-imposed exile, refusing to return if he has to serve jail time for a graft conviction he says was politically motivated. In Thailand, viewers would be likely to associate Ing's depiction of red-clad protesters with pro-Thaksin supporters known as the "red shirts", who brought central Bangkok to a halt for nine weeks in 2010 before their movement was ended by the military. Ing defended her use of the color. "Red is the universal color for killer. In Thai soap operas the bad guys wear red, so why am I not allowed to use it?" "Did Thaksin affect my life? Absolutely. In this sense the film is a political one but we also wanted to bring Shakespeare to a Thai audience," she said. "We made a Shakespearean film because we are living through Shakespearean times. People find the truth in fictional form threatening." Maybe the movie could turn out divisive between the Dear Leader and his sister. Will it get down to "just a family affair"? BANGKOK:-- A co-producer of the banned Thai film "Shakespeare Must Die", which has been construed as a criticism of Thaksin Shinawatra and the red shirts, said he will launch a petition campaign to overturn the Film Board's April 3 decision to outlaw screenings of the work. "Most people cry for [freedom of expression] when they have no power. Once they have power they don't want give the freedom to others. Every government and every political group is like that," Manit Sriwanithpoom told The Nation by phone yesterday, adding that if the red shirts can't handle criticism, they should stop calling their movement democratic. The film is set in a fictitious kingdom in which a power-mad politician eventually commits regicide. Supporters of this autocratic leader then lynch the director of an adaptation of William Shakespeare's play "Macbeth", who tries to expose the fraudulent leader. The Film Board simply informed 50-year-old Manit that the film was banned from being screened, sold or distributed in the Kingdom because it would "cause disunity among people in the country", with no further explanation offered to the producer. "There was no justification," said Manit, who added that the board told him to alter the film - without saying which parts should be changed - if he wanted the film to be cleared for screening. "They said they're worried about it because the country is in a reconciliatory mode." Manit believes the film was banned because it can be interpreted as being critical of Thaksin and the red shirts. In the film, which contains no direct references to Thailand, Siam or the like, the power-hungry politician eventually usurps power from the king, while supporters of "Excellency the Leader" want him to rule the country in a dictatorial fashion. "Red shirts may think I'm defaming Thaksin and the reds but I am not. Is the lese majeste law now expanded to protect Thaksin and the red shirts? They must listen [to criticism] and have no right to ban things. Whether they agree or disagree, they must be open-minded. If they think [the film] should be banned, then they should change their name [from that of a pro-democracy movement]," said Manit, who's also a well-known artist and art photographer. Manit said one of the seven members of the Film Board insisted to him that the film had to be banned because Thais can't separate reality from fiction when they see a film. Manit thinks differently, saying Thai society is divided anyhow, with or without the film - which is directed by his partner, Ing Kanjanavanit - between staunch critics of Thaksin on one side, and red shirts on the other. He plans to submit a petition to the Culture Ministry, which has oversight of the Film Board, on April 17. Manit said film is arguably the country's most heavily censored medium, being more tightly controlled than newspapers, television, radio and the Internet. Under the Film Act, those who violate bans can face up to a year in prison and be fined up to Bt100,000, or both. Manit said he is contemplating defying the ban and screening it in a public venue, braving arrest in order to demonstrate that there's no freedom or democracy in this country. "Why don't they let the people exercise their own judgement?" asked Manit. "I told them please don't ban [the film], because it will become news all over the world, but they didn't say anything."